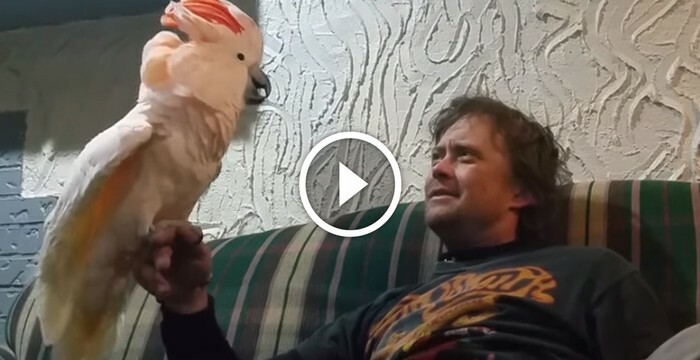 Whenever He Squeezes This Parrot’s Tummy, She Makes The Funniest Noise! Dad Turns On The Radio. But When His Parrot Heard THIS Song Playing? ROFL! His Owner Tells Him That It’s Time To Go In The Cage. What He Says Back? Hilarious! Town Refuses To Help A Poor Eagle Hanging From A Tree. Now Watch What An Army Veteran Does. Nothing Will Please Your Eye More Than What You See At The Bank Of This River. Beautiful! Rooster Too Scared To Enter The Coop At Night. When They Learned Why? OMG! Dad Asks Cockatoo ‘Do You Love Me?’ – I Couldn’t Stop Laughing At Her Response!